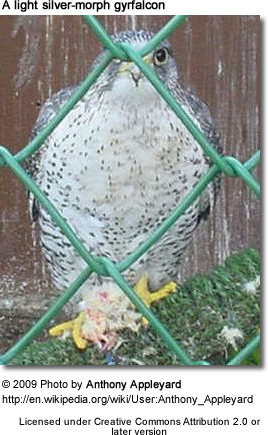 The gyrfalcon or Falco rusticolus, also spelled gerfalcon, is the largest of all falcon species. 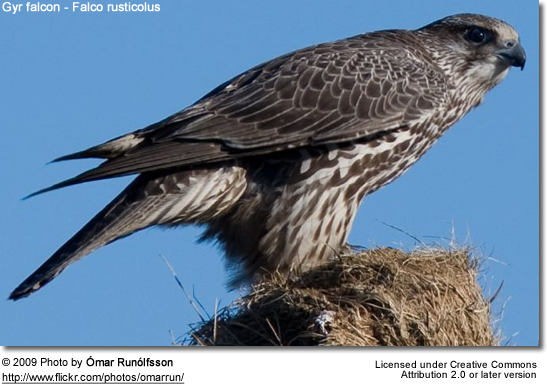 The Gyrfalcon breeds on Arctic coasts and islands of North America, Europe and Asia. 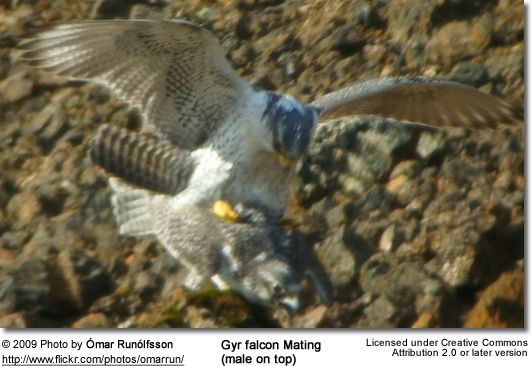 It is mainly resident, but some Gyrfalcons disperse more widely after the breeding season, or in winter. This species is a very large falcon, about the same size as the largest buteos. Males are 48 to 61 cm (19 to 24 in) long, weigh 805 to 1350 g (1.8 to 3 lbs) and have a wingspan from 110 to 130 cm (43 to 51 in). Females are rather bulkier and larger at 51 to 65 cm (20 to 26 in) long, a weight of 1180 to 2100 g (2.6 to 4.6 lbs) and have a wingspan ranging from 124 to 160 cm (49 to 64 in). 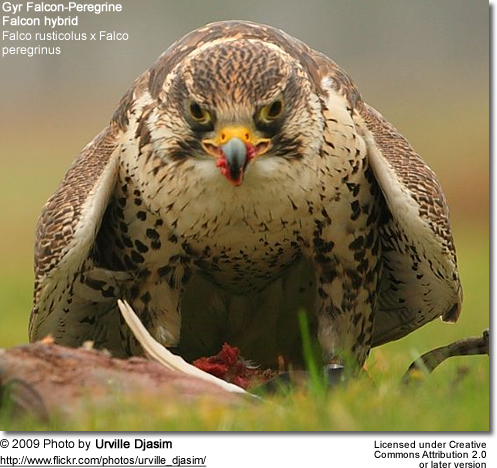 In dimensions, gyrfalcons lie between a large Peregrine Falcon and a hawk in general structure; they are unmistakably falcons with pointed wings, but are stockier, broader-winged, and longer-tailed than the Peregrine. Plumage is very variable in this highly polymorphic species: the archetypal morphs are called "white", "silver", "brown" and "black" though coloration spans a continuous spectrum from nearly all-white birds to very dark ones. The brown form of the Gyrfalcon is distinguished from the Peregrine by the cream streaking on the nape and crown and by the absence of a well-defined (cheek) stripe and cap. The black morph (genetic mutation) has its underside strongly spotted black, not finely barred as in the Peregrine. 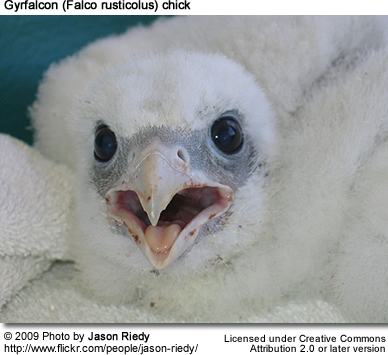 White form Gyrfalcons are unmistakable, as they are the only predominantly white falcons. 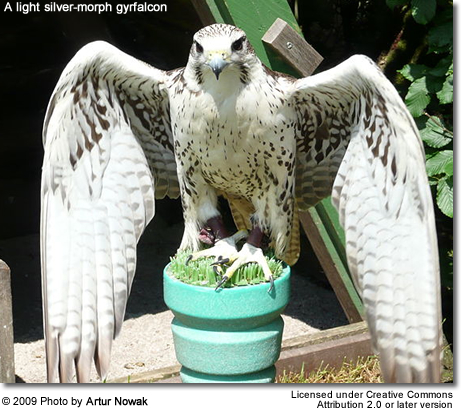 Silver birds resemble a light, grey Lanner Falcon of huge size. There is no difference in colouring between between males and females; juveniles are darker and browner than corresponding adults on average. 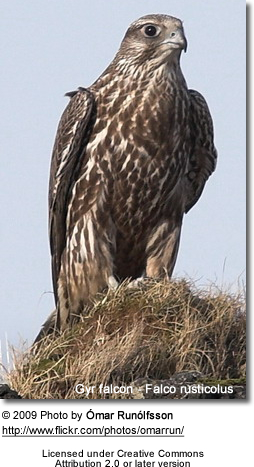 The Gyrfalcon is a member of the close-knit hierofalcon complex. In this group, there is ample evidence for rampant hybridization and incomplete lineage sorting which confounds analyses of DNA sequence data to a massive extent; molecular studies with small sample sizes can simply not be expected to yield reliable conclusions in the entire hierofalcon group. The radiation of the entire living diversity of hierofalcons seems to have taken place in the Eemian Stage at the start of the Late Pleistocene, a mere 130,000-115,000 years ago; the Gyrfalcon seems to represents lineages that expanded into the Holarctic and adapted to local conditions, whereas the inland populations further south, towards northeastern Africa where the radiation probably originated, evolved into the Saker Falcon. 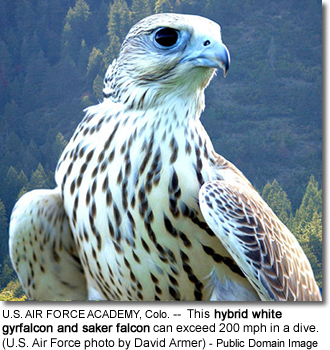 Indeed, gyrfalcons hybridize not infrequently with Sakers in the Altay Mountains, and this gene flow seems to be the origin of the "Altai Falcon". As F. rusticolus has such a wide range, it is not considered a threatened species by the IUCN. It is not much affected by habitat destruction, but pollution e.g. by pesticides had depressed its numbers in the mid-20th century, and until 1994 it was considered Near Threatened. Improved environmental standards have allowed the birds to make a comeback, and today they are not rare in most of their range. The Gyrfalcon is the official bird of Canada's Northwest Territories. The White falcon in the crest of the Icelandic Republic's coat of arms is a variety of this species. 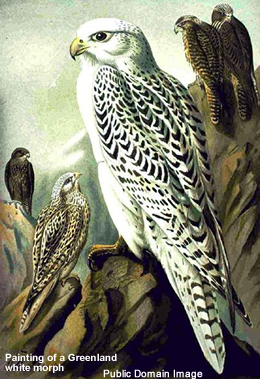 In medieval times, the Gyrfalcon was considered the king's bird. Due to its rarity and the difficulties involved in obtaining it, in European falconry the gyrfalcon was generally reserved for kings and nobles. Very seldom was a man of lesser rank seen with a Gyrfalcon on his fist.